Huey 624 –The workhorse of our fleet. 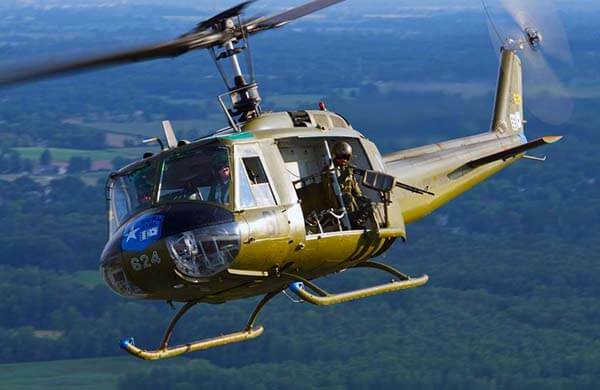 In July 1967, she was fielded by the US Army brand new from Bell Helicopter, and sent to Vietnam in December of 1967. She was assigned to combat service with the storied 61st Assault Helicopter Company. The dice showing 6 & 1 denote the unit designation 61st and also adds up to 7 which means Good Luck, thus the call sign “Lucky”. The “Star” is derived from the single star atop the Army Senior Aviators’ Badge. The 61st gunship would bear “Star Blazers” to symbolize the speed & power of the gunships. 624 logged over 2200 combat flight hours in Vietnam carrying a host of wounded American Soldiers, including many who gave the ultimate sacrifice in this aircraft.